We love sharing traditional Japanese dishes with our customers. You can find all of our favourite Japanese essentials throughout our menu, some more common than others. One huge staple in Japanese street food is Takoyaki, a fried octopus-filled ball drizzled with mayo and okonomiyaki sauce then garnished with katsuobushi. Sounds like a mouthful, right? Let’s break down the components so you’re up to speed on this popular savoury treat! First, a little history. The origin of takoyaki’s name is simple: it’s the type of pan this dish is cooked in! The word yaki stems from yaku, meaning “to fry or grill”, one of the main cooking methods in Japanese cuisine. Popularized in Osaka (initially in the Kansai region) in 1935, takoyaki has grown from strictly street food to being a staple in well-established takoyaki restaurants. You can even find it in supermarkets and 24-hour convenience stores. So what makes takoyaki so delicious? We start with a wheat batter ball filled with minced octopus, and form it around a bite of fresh octopus meat, then wrap it in tempura batter and green onion. Next, Nomiya’s own okonomiyaki sauce. We add a drizzle of mayo and finish with a garnish of katsuobushi: smoked and shaved skip jack tuna. 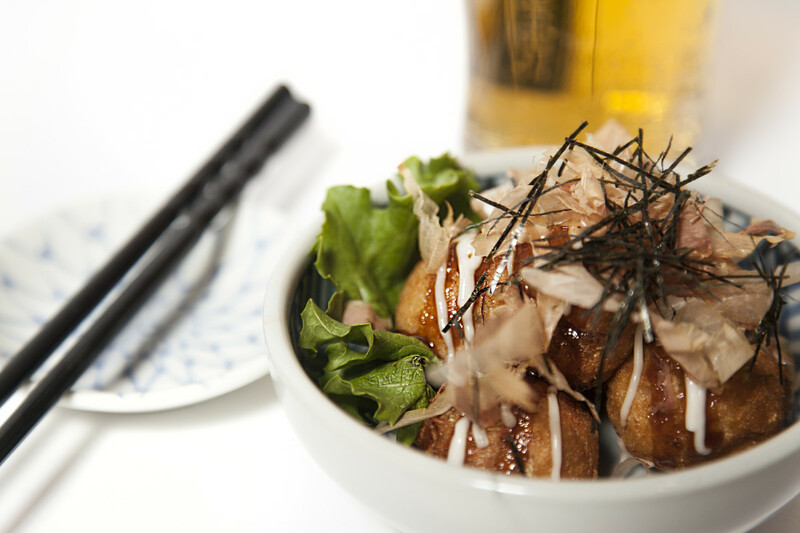 Enjoy an order of takoyaki with your next meal at Nomiya!